Case Story: Peter Ettles, 3K Pursuit. Last year I received an email from Peter Ettles from Scotland asking me for help towards the World Track Championships. Peter had 3K pursuit as his main discipline and scratch race and points race as secondary events. 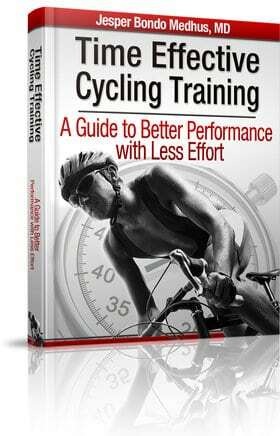 That email had the perfect timing because I at the same time was working intensively testing and optimizing the principles for my e-book, Time Effective Cycling Training. After a few emails I understood that Peter was a very busy person who was very limited in training time and also limited in training time on the track. So it was not an easy job, but I thought it could be a really good way to see if my high intensity training principles would work on ‘older’ cyclists. And just to emphasize the power of this test, Peter was actually preparing for the World Championships in his age group. So it couldn’t be a better scene to show how my training concept worked. Since Peter had the 3K pursuit as his primary goal, I decided to make his 3,5min maximum power output the value we would track his performance progress with. In the first week of the training program he performed 396W with a body weight of only 76,0kg. Riders who have experience with power meter training will know that these numbers are highly respectable. And please remember that this guy was competing in age group 45 to 49. So it was clear that Peter was already performing really well, but nevertheless, he wanted to do even better. That was some kind of a challenge for me! I decided to make a full training plan of 13 weeks with an average training time of 10hours per week (range: 6 to 15hours per week). His training was targeted the physiological skills required for an optimal performance at the track events he was participating in. Though, there was a primary focus on the 3K pursuit, because that was his personal favorite. When it comes to track cycling, specificity of the training sessions becomes extremely important. So, Peter did a lot of anaerobic and VO2 max intervals in different combinations because it was both time effective training and also very specific towards the challenges he was preparing for. I would have wished Peter had more time on the velodrome in Manchester, but with a travelling time of app. 6hours it was clear that we had to accept that he wouldn’t get the most optimal training for track cycling. After 12 weeks Peter entered the velodrome in Portugal shortly after performing his best 3,5min test ever. Peter won the bronze final in World Championships 3K Pursuit, Age Group 45 to 49. “In 2010 I decided to try to get in shape for the world masters track champs. The pursuit was going to be my main aim. It was not going to be a easy task as I also work full time running my own forestry business. 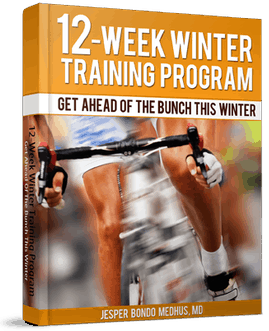 I got a 13 week training programme from training4cyclists.com. First I did a 3.5 min max test to see what sort of power I was producing. I did 396W. The bulk of the programme consisted of very high intensity intervals varying from 10second sprints up to 5min repeats. The intervals, although being very hard, were a great challenge and really made to look forward to the training as you could actually feel yourself getting better and stronger with every session. At the end of my 13 weeks including a proper taper, I was amazed to find my power over 3.5 mins was now up to 424W. That’s 28W increase! I had also lost a couple of kilos which was an added bonus. So this was a success story of how time effective training principles can be used to compete at international level. Peter did a really great job and I was very glad when he won his bronze medal. That result gave me the final confidence to launch my e-book one month later. If you want to use some of the principles mentioned above, please make sure to get your own copy of Time Effective Cycling Training. Congratulations with the great result – it must have been a great experience. I could see that you had a time of about 3:38. Impressive. But how do you test in 3.5 minutes.? Is it 3.5 min. all-out with an average of 424w or is it 30 sec. (600w), followed by approx. 3 min. (395w) = avg.tot. 424w. It is far different ways to test on. I ask out of simple ignorance:). But on television, it looks as though they start with a sprint to get the bike up to speed. I have pretty okay wattage in a 5 min. all-out (5.5 w / kg . )… but this figure would be much lower if I started with a sprint. Another thing is that Peter must have been focusing on LT and VO2-max earlier in his “blocks” of training or periodization. But how much and how..? A physical test should always simulate the challenges you are preparing for. So it is a very essential question you ask. I decided to make a customized physical test where I had no reference values, but I knew it made sense, because it was so so specific for the pursuit he was preparing for. Peter did a 3.30min maximum test and was supposed to ride it like a pursuit, (start, fixed gear etc.) I believe that was the most relevant, reproducible, low-cost and time saving way to track his progress. Hi Jesper – do you have a track sprint training program? I didn’t see one in your book. Sorry, there is no specific track sprint training program in my e-book. There are some sprint training advice as you probably have noticed, but these tips are targeted for traditional road cyclists, not specific for track athletes. This might be a topic for a future article, though. I will be competing in the 3 km track pursuit masters 4 state titles in early march 2012 I was hoping to get a training program from you. I do train on watts at the moment. cheers jesper the most extensive principles on trainning ive read simple and clear . have you some interval and long rep sessions for cross country racing aiming at nothing over 50 km . .
been doimng the following for 25 weeks base trainning dont know how to change the intervals or whether to do more short fast rides . fri short fast ride 40 50 km 3 x 90 sec last 4 min in zone 4 -5 4 x 100 up hill high gear . sat 90 minutes over technical course of 30 km . 2 hrs alternate saturdays . The Blood Passport Program… For or Against?